Qnostics is pleased to be attending ECCMID 2018 at IFEMA – Feria de Madrid from 21st – 24th April. Frank Opdam and Caterina Netti will be available at booth 141. We welcome ECCMID attendees to stop by our booth or contact us to arrange a meeting. 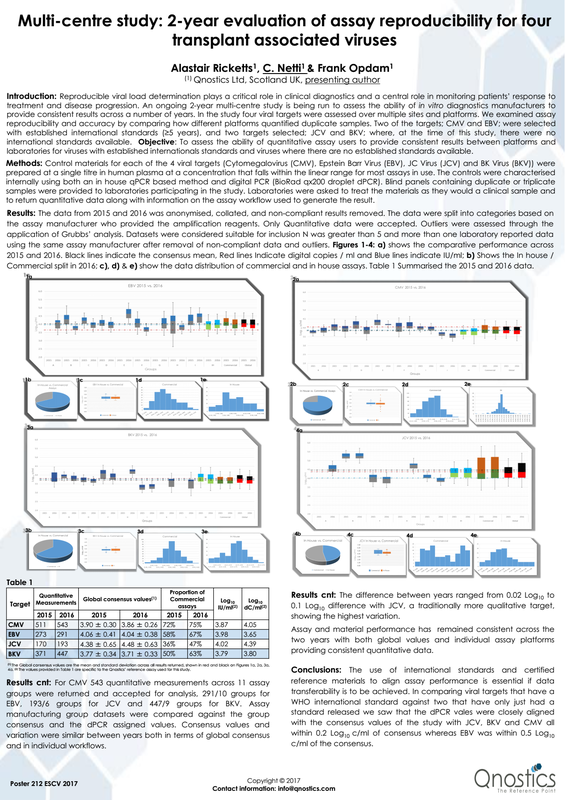 Our poster on ‘Characterisation of three Enterovirus types in the absence of standardized reference materials’ (P0065) will be presented in session PS004, ‘Real-life issues in diagnostic virology’, on Saturday 21st from 15:30 – 16:30. 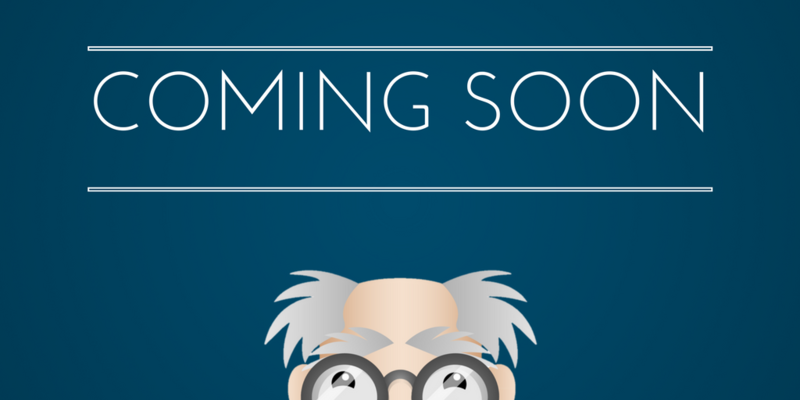 For further information please contact the Qnostics PR Team: phone +44 (0)141 946 4207 or email info@qnostics.com. The Association for Molecular Pathology (AMP) 2017 Annual Meeting begins this Thursday. From 16th – 18th November, you can find us at Booth 1808 in the Exhibit Hall at the Salt Palace Convention Center, Salt Lake City, UT. You can also find our poster, “HPV: The Use of Full Process Controls to Monitor Extraction Variation” (ID10), in the Exhibit Hall, Lower Concourse. To arrange a meeting please contact info@qnostics.com. Qnostics is attending the 10th European Meeting on Molecular Diagnostics (EMMD) 2017 in Noordwijk, The Netherlands, 11th – 13th October. 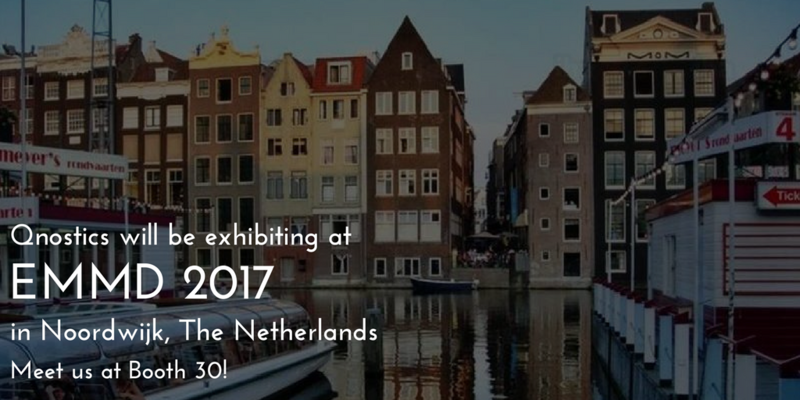 Meet us at Booth 30 to learn more about Qnostics’ new Meningitis / Encephalitis (ME) Evaluation Panel. GLASGOW, UK, September 15, 2017. Qnostics, a leading European provider of molecular quality control products and services for clinical diagnostic laboratories, announced today the launch of the Meningitis/Encephalitis (ME) Evaluation Panel for multiplex molecular diagnostic testing. The Panel consists of a total of 14 different controls for the qualitative detection of Bacterial, Viral, and Fungal targets i.e. Neisseria meningitidis, Haemophilus influenzae, Escherichia coli K1, Listeria monocytogenes, Streptococcus agalactiae, Streptococcus pneumoniae, Cytomegalovirus (CMV), Herpes Simplex Virus 1, Herpes Simplex Virus 2, Human Herpes Virus 6, Enterovirus, Human Parechovirus, Varicella Zoster Virus and Cryptococcus neoformans / gattii. The ME Evaluation Panel may be used to independently monitor each target and all phases of the testing process to ensure consistent and accurate results. “With the increase of installations of multiplex molecular diagnostic platforms and disease-specific tests in the clinical lab, it is critical that hospitals are able to implement and monitor these tests with the appropriate level of quality control,” said Frank Opdam, Head of Commercial of Qnostics. “Many critical and costly treatment decisions will be based on the results of these tests so it is important that the tests are properly verified on a regular basis and during reagent lot changes. The ME Panel serves especially the European, Middle East and African (EMEA) markets where we received messages that quality control materials for the meningitis-disease related range of targets were difficult to get hold off’. Each of the panel members are whole organism mimicking patient sample as close as possible. The Qnostics ME Evaluation panel has been designed with known performance on the BioFire FilmArray® Platform. Charudutt Shah, Director of Marketing EMEA for BioFire Diagnostics said: “I am really delighted to be able to support our customer base better now with a quality control solution that can help the labs to maintain regulatory compliance for our qualitative FilmArray® ME Panel. Our panel simultaneously tests for 14 bacterial, viral and fungal pathogens in one hour which is often a challenge for customers to verify. The introduction of Qnostics panel now allows our customers to perform assay verification optimally and improve lab efficiency.” The Qnostics ME Panel is optimised with a pooling strategy for assay verification which is described in a technical note. The technical note can be extracted by FilmArray® users from BioFire’s website. Qnostics Ltd., with head-quarter in Glasgow UK, provides a comprehensive line of molecular diagnostic quality control products that assist laboratories in meeting current ISO15189 regulations regarding quality. Qnostics consistently develops new standards, external run controls, and evaluation kits for molecular testing in clinical diagnostic laboratories. All Qnostics procedures are developed and manufactured in an ISO13485 certified facility. 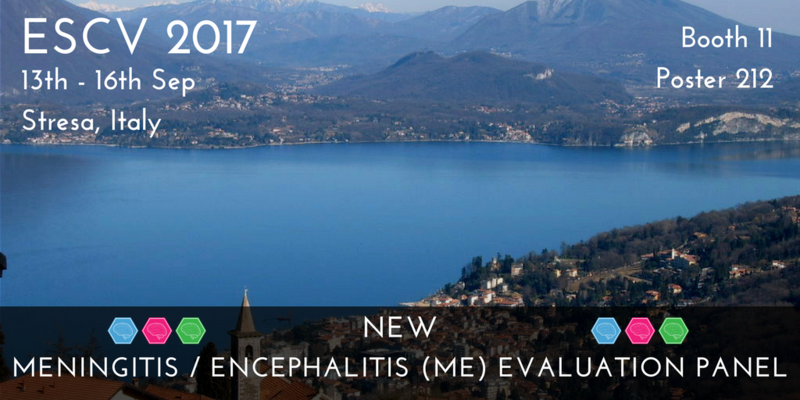 Qnostics is pleased to be attending ESCV 2017 in Stresa, Italy from 13th – 16th September. Meet us at Booth 11 to find out more about the launch of Qnostics’ Meningitis / Encephalitis (ME) Evaluation Panel. We will also be presenting our poster (no. 212) titled “Multi-centre study: 2 year evaluation of assay reproducibility for four transplant associated viruses” at the conference. Qnostics is currently expanding their Molecular Controls Sales Operations in the US territory. The successful candidate will be expected to bring their business skills to develop both existing and new business for Qnostics and be responsible for expanding the customer base for Qnostics’ off-the-shelf products as well as B2B solutions. Click here for more information. As part of the operations team, perform the maintenance and supply of materials, facilitate daily shipments, assist with product assembly and dispatch, ensure that work is carried out accurately to the required standard in the agreed timescales and that inventory management systems/areas are maintained/updated in a timely manner. Click here for more information. JOB SUMMARY: You will be part of the operations team supporting the maintenance and supply of materials, facilitating the daily shipment of materials, assisting with product assembly and dispatch, ensuring that work is carried out accurately to the required standard in the agreed timescales and that inventory management systems/areas are maintained/updated in a timely manner. EXPERIENCE: Prior experience of inventory control, warehousing, international shipments, handling/working with biological substances or working in a controlled laboratory environment (GLP/GMP) is beneficial however full training will be provided. To assist in the management of stock and inventory systems to ensure accuracy levels are realised. To support all operations teams in stock movement, build and shipping processes. To follow processes to ensure consistency and accuracy across all Operational processes. To complete paperwork accurately weekly e.g. BOM’s, MBRs, order/packing/requisition forms etc. To support in the preparation of shipments and prepare packaging (labelling, boxes, panel packs and bags). To support the tracking of shipments, coordinating or escalating issue resolution and provide shipping order status updates against delivery dates. To transact materials timely ensuring inventory systems accurately reflect stock levels e.g. BIMS/WASP etc. To support the movement/identification of stock and that locations, quantities and statuses are correct. To support strong relationships with both internal and external customers through all channels of communication. To participate in surveillance activities such as tracking, trend analysis, complaints and other duties, immediately notifying supervisor/management of potential issues/concerns timely. To support the maintenance of the laboratory and equipment used when carrying out the relevant processes. To identify and propose areas for improvement (efficiency, performance, processes etc) defining the opportunity and potential benefits. Accurately follow procedures/protocols as required in accordance with the company Quality System, and current departmental plans, and accurately complete all quality documentation timely as required. Support and assist other members of teams/departments to ensure the effective completion of training and projects. To undertake any other reasonable duties as required by Qnostics ltd.
understand the importance of stock accuracy, following processes and traceability. experience of international shipments, ideally of dangerous goods. some knowledge in the handling/transit/storage of temperature sensitive biological materials. OTHER: This role may require travel to and working at other operations within the business. Salary is dependent on experience, please state salary expectation upon application. Pension and Private Healthcare are provided. The role will be full-time and based in Glasgow. Click here to apply or contact info@qnostics.com.